Thousands of volumes of Civil War letters are available, but little more than a dozen contain collections written by native Germans fighting in this great American conflict. 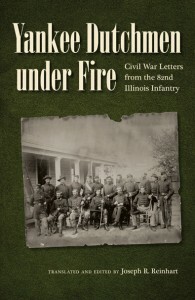 Yankee Dutchmen under Fire presents a fascinating collection of sixty-one letters written by immigrants who served in the 82nd Illinois Volunteer Infantry Regiment. The 82nd Illinois was one of the thirty or so predominantly “German Regiments” in the Union army, and one of only two Federal regiments containing a Jewish company. Fighting alongside the Germans was a company of Scandinavians, plus a scattering of immigrants from many other countries. The letters span nearly three years of war and include firsthand accounts of major battles: Chancellorsville and Gettysburg in the East and Missionary Ridge, Resaca, New Hope Church, and Kolb’s Farm in the West. The soldiers of the 82nd Illinois also describe campaigning in East Tennessee, Sherman’s Atlanta campaign and his March to the Sea, and the Carolinas campaign (including the Battle of Bentonville). The majority of the letters originally appeared in wartime issues of German American newspapers and kept the German community informed of the regiment’s marches, camps, battles, and casualties. Lt. (later Capt.) Rudolph Müller, an idealistic and highly critical commentator, wrote twenty-one of the twenty-nine private letters to his close friend and confidant Col. Friedrich Hecker. Müller cautioned the colonel not to make his letters public because they often contained highly critical comments about commanders, fellow officers, public figures, Anglo-Americans, and American society. Besides providing details of military life and combat, the documents reveal how the German-born writers viewed the war, American officers and enlisted men, other immigrant soldiers, and the enemy. They shed light on the ethnic dimensions of the war, including ethnic identity, ethnic pride and prejudice, and ethnic solidarity, and they reflect the overarching political climate in which the war was fought. Yankee Dutchmen under Fire is a valuable addition to Civil War studies and will also be welcomed by those interested in ethnicity and immigration. Joseph R. Reinhart is an independent scholar who has researched and written about Germans in the American Civil War for almost twenty years. He is the author of a regimental history and the editor and translator of four books containing collections of letters of German-born soldiers who fought for the Union.